It's another Monday and it's time for another Joke to Start the Week. 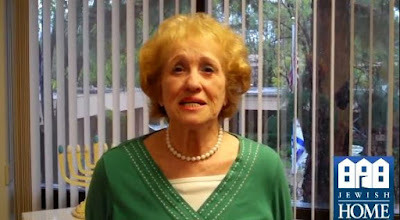 Today we're taking another deep dive into the Internet and coming up with an oldie but goodie retold by Jerri Kane, a resident of the Los Angeles Jewish Home. 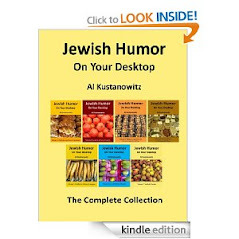 Tully began doing "kosher comedy." Yiddish Eli Basse songs such as "Oomglick Blues" and "Litvak and Galitz" turn up on his first album, "Seltzer on the Rocks." He expanded for more mainstream comedy for his two-record contract with Jubilee, which coincided with his expanded touring all over America. 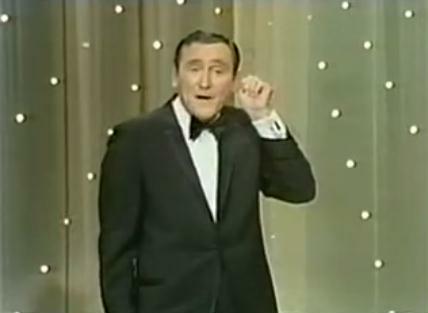 Here's a video of Lee Tully performing on The Hollywood Palace hosted by Sammy Davis Jr. in 1967. Josh Warshawsky has shared his original melodies with Jewish communities throughout the country. His first full-length album, “Mah Rabu”, features such hits as “Mah Rabu”, “Kol B’Ramah”, and “V’ahavta”, which can be heard at Ramah and URJ summer camps as well as at NFTY and USY conventions across the country. 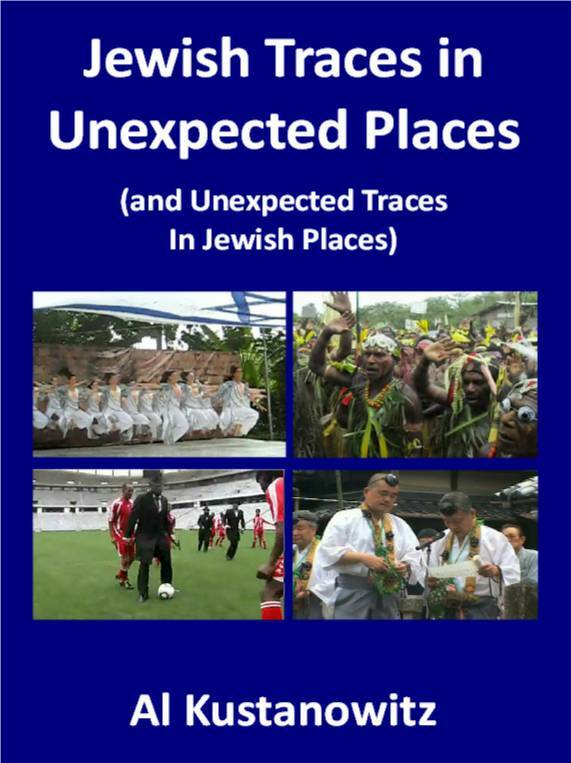 Josh is currently in Rabbinical school at the Ziegler school of Rabbinic Studies in Los Angeles, and he has spent the last two years as the artist-in-residence and music specialist at Temple Beth Am and Pressman Academy in Los Angeles, CA, where he brought new musical energy to children and adults of all ages. He has transformed his home into a much-needed space in the LA area for Jews in their 20s and 30s of all denominations to celebrate Shabbat and holidays together. Josh is currently on the faculty of Songleader Boot Camp, where he helped to create a special track to bring together Ramah songleaders for the first time. Over the last six years, Josh has worked as the musician in residence at USY’s international convention, leading ruach, song sessions, and writing original music for the last two conventions. 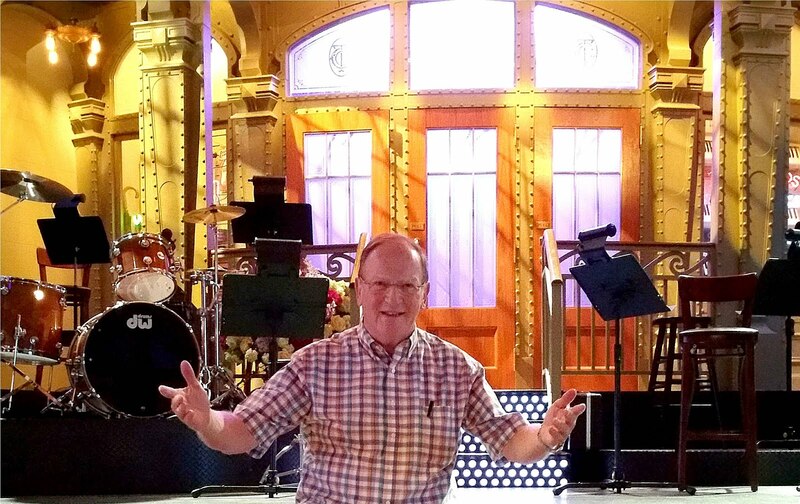 This summer, he will be embarking on his second Jewish Summer Camp Tour, spending a week to a month in residency teaching and sharing music and Tefillah at Ramah Ojai, Ramah Wisconsin, Ramah Nyack, Ramah in Northern California, and Ramah in the Berkshires. 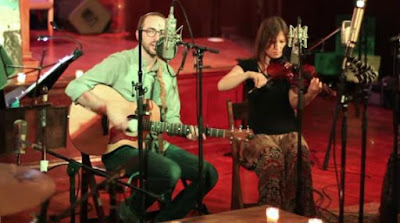 Anim Zemirot, sung during the Shabbat service, is given a new melody in this excerpt from Josh's album Chaverai Nevarech. For my soul longs for you. 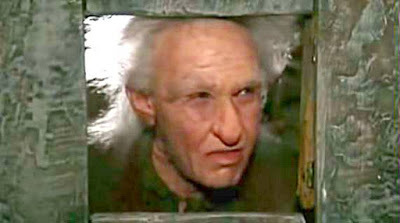 Throwback Thursday Comedy Special: Billy Crystal as Miracle Max in "The Princess Bride"
In the 1987 film The Princess Bride, Billy Crystal wore so much makeup that it was hard to recognize him in his role as Miracle Max, the crooked old healer living in the woods with his wife, played by Carol Kane. And just listening to his voice made us think that the role was being played by Mel Brooks as the 2000 year old man. Rick Rosenthal spent much of December sitting children on his knee, asking whether they’ve been good and listening to their Christmas wishes. On Saturdays, he may have slept overnight in the building. And he only accepts payment after nightfall. Rosenthal began playing Santa at age 16 as a gag. He would dress up and hang mini bagels on his non-Jewish friends’ Christmas trees. He occasionally played the part in subsequent decades. 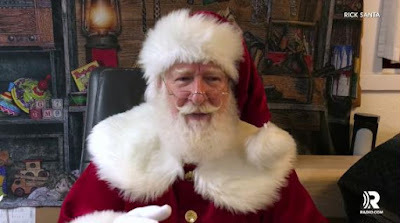 But he became a full-time Santa seven years ago when two things happened: First, his parents passed away within two weeks of each other, which led him to grow out his beard, a custom of the traditional Jewish 30-day mourning period after a parent’s death. Soon after he was shopping at Home Depot when he noticed that a little boy was staring at him transfixed, sure that he was Santa Claus. Since then, Rosenthal has become Santa year-round. He and his wife, Tracy, run a Santa school, Northern Lights Santa Academy, that hosts three-day weekend seminars on how to be Santa. The school covers everything from fashioning a good costume to making sure you have legal and insurance protection in place. But the seminars also promise fun times, like a Christmas movie screening and a photo op with a live reindeer. The couple also runs the National Santa Agency, which books a network of 100 Santas, Mrs. Clauses and elves for private parties and events. Rosenthal is a member of the International Brotherhood of Real Bearded Santas. The choir spent many years performing at the V&A Waterfront in Cape Town, entertaining visitors from across the world. Their rich and powerful performance is built on a varied repertoire consisting of famous traditional songs, as well as a large selection of original songs mostly themed around social issues. After their performances they work with boys in their neighborhood, acting as mentors and role models to involve the boys in constructive activities. In this video they sing three Hebrew songs: Hevenu Shalom Aleichem, Mikimi, and Ki Va Moed. 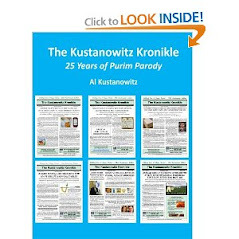 As we are surrounded today by Christmas songs playing on the radio and TV, and with the music finding its way into elevators, supermarkets, and shopping malls, it's interesting to note that most of the popular songs were written by Jewish songwriters. An offbeat, irreverent documentary called Dreaming of a Jewish Christmas tells the story of a group of Jewish songwriters, including Irving Berlin, Mel Tormé, Jay Livingston, Ray Evans, Gloria Shayne Baker and Johnny Marks, who wrote the soundtrack to the world's most musical holiday. It's an amazing look at the 20th century North American immigrant experience and the extraordinary outburst of musical energy from the children of those immigrants. This new generation rejected their parents' European past and instead embraced Tin Pan Alley, Broadway and, finally, Hollywood. The outsiders began writing the soundtrack to the insiders' American dreams and in doing so, wrote themselves into history. Telling this story through words and song, Dreaming of a Jewish Christmas features rarely-seen archival footage, musical performances and interviews with contemporary writers and performers, as well as connoisseurs of North American popular music. The 52 minute documentary is available on iTunes for $2.95. You can see it free of charge if you are a member of a public library that offers free streaming of Kanopy films. Gad Elmaleh is a Jewish Moroccan-born French stand-up comedian and actor. He has starred in several feature films, including Coco, Priceless, La Doublure and Midnight in Paris. 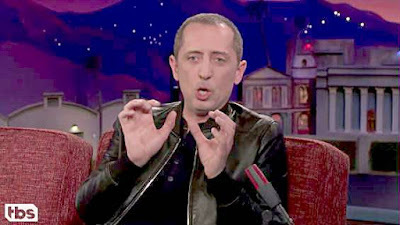 He has been voted the funniest person in France and was named knight of the Order of Arts and Letters by the Minister of Culture. He was also named knight of the National Order of Quebec. He is often referred to as the "Seinfeld of France". In 2015, Elmaleh did a national comedy tour across the United States. His new comedy special American Dream is now available on Netflix. In this video clip from the Conan late night show, Gad is learning English and having trouble coping with the fact that he will never know how old a toddler is and how much is actually in a bunch. 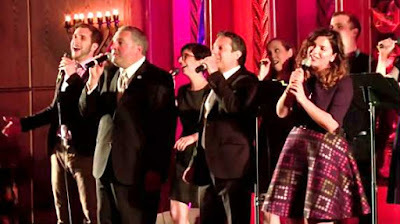 The Ruach Singers are a Toronto-based 8-voice professional Jewish a cappella group specializing in creating innovative liturgical and Hebrew vocal music. They bring a fresh approach to the traditional sound, taking style cues from contemporary jazz/pop a cappella and modern world music. Their music can be found at Shabbat services, Bar and Bat Mitzvahs, Weddings and Music Festivals Worldwide. 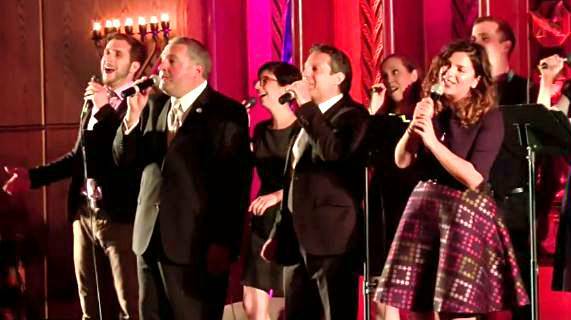 In this rendition of Adon Olam, the Ruach Singers are joined by Cantor Eric Moses, Cantor Gideon Zelermyer, and Amanda Levine. 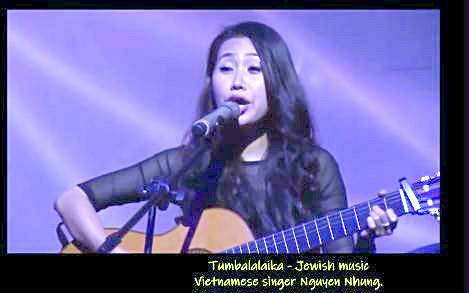 This performance was recorded at the CROSSROADS 2018 concert at Beth Sholom Synagogue in Toronto on May 29, 2018. 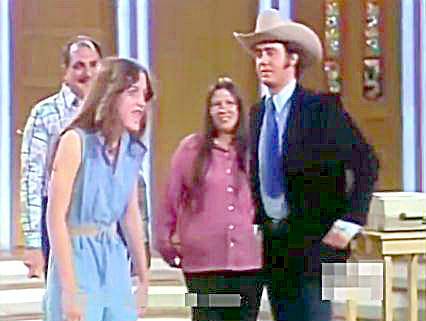 When it came to off-beat bizarre comedy, Andy Kaufman was king. His comedy was always an enigma from the time that he first appeared on the stage. He disdained telling jokes and engaging in comedy as it was traditionally understood, calling himself a performance artist. In a rare introspective interview, he said "I am not a comic, I have never told a joke. ... The comedian's promise is that he will go out there and make you laugh with him... My only promise is that I will try to entertain you as best I can." And entertain he did. We remember him most for his debut performance on Saturday Night Live with the Mighty Mouse song (Here I come to save the day...), his Elvis Presley impersonations, and his role as Latka, the unspecified European man on the Taxi sitcom. On this Throwback Thursday we're going back 42 years to 1986, when Andy sauntered onto the stage on Van Dyke and Company sporting a cowboy hat and led four unsuspecting audience volunteers in a hilarious pantomime of Old Macdonald Had a Farm. 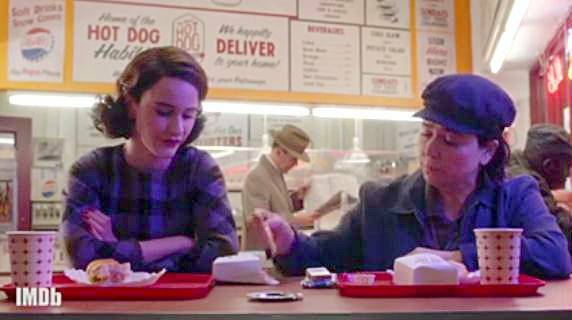 The hit comedy series The Marvelous Mrs. Maisel is now in its second season, with all 10 episodes now running on Amazon Prime Video as of December 5. Two hilarious episodes in the middle of the series take the Maisel and Weissman families to the Catskills for a two month stay. The lead and supporting actors are all marvelous, but a surprise standout is Alex Borstein, who won an Emmy for her role of Susie Meyerson, the tough-talking manager of budding comedian Miriam (Midge) Maisel. 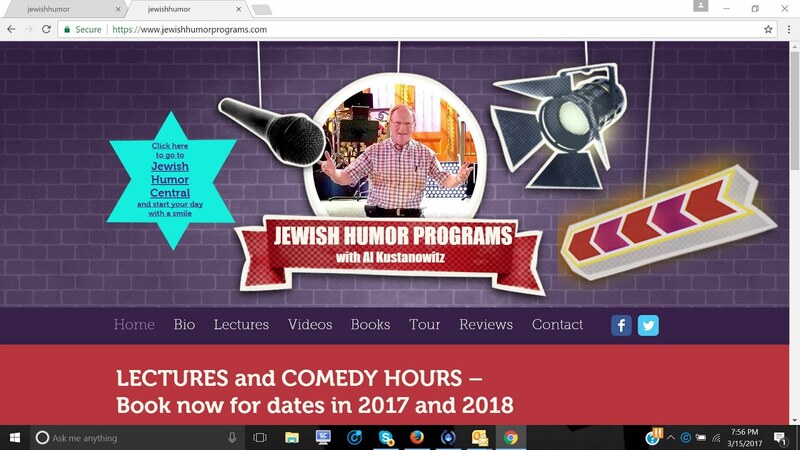 Borstein is not a newcomer to TV comedy. Her credits include Gilmore Girls, MadTV, Getting On, and Family Guy. In interviews, she talks about growing up as the daughter of a Holocaust survivor, her life with two children in Barcelona, and her comfort in playing a role as part of an extended Jewish family. Here is a video from IMDB reviewing her career so far. 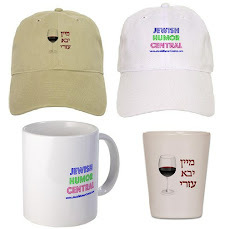 We've been following the career and shtick of comedian Modi Rosenfeld ever since we started Jewish Humor Central in 2009. Whether it's his standup comedy or clever skits and short films, he always leaves us laughing. In June Modi was honored by the city of New York with a proclamation naming June 26, 2018 as Mordechai (Modi) Rosenfeld Day. Amid a strictly kosher barbeque featuring hamburgers, vegetarian burgers, hot dogs, corn on the cob, salads, pickles, wine, beer, watermelon, brownies and blue and white cookies in tribute to the State of Israel, guests gathered on the mayoral residence’s rear lawn, enjoying a perfect summer evening with magnificent river views. Mayor de Blasio and his wife Chirlaine McCray continued their annual tradition of sprinkling their speeches with a smattering of Hebrew words and discussing “tikun olam,” with the mayor speaking out, as in previous years, against BDS while McCray discussed mental health issues. 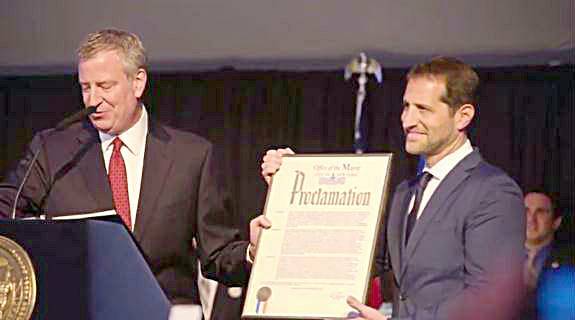 Describing Israel as New York City’s “sixth borough,” de Blasio introduced Israeli Consul General Dani Dayan, who spoke briefly, and also presented a proclamation to the evening’s honoree, actor, comedian and cantor Mordechai Rosenfeld, better known by his stage name, Modi. In accepting the proclamation, Modi didn't disappoint the guests. He delivered a short, funny commentary which you can watch below. 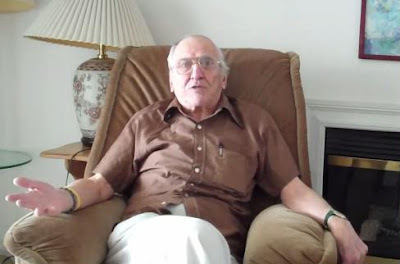 Today we're taking another deep dive into the Internet and coming up with an oldie but goodie retold by Ellis Simon, a resident of the Los Angeles Jewish Home. The Yiddish folk love song Tumbalalaika originated in Eastern Europe in the 19th century, but its exact origin is hard to pinpoint. That hasn't prevented it from being sung and played over and over, not only in places where Yiddish songs are sung, but just about everywhere in the world, in vocal and instrumental versions, in cabarets and in the movies. Just as we have followed the songs Hava Nagila, Adon Olam, Hevenu Shalom Aleichem, and Abanibi as they took different forms as interpreted by a wide variety of singers, musicians, and dancers, we're continuing the series today that we started back in 2012, bringing you many interpretations of this universal courting and love song. This rendition of Tumbalalaika was recorded by Vietnamese singer Nguyen Nhung.